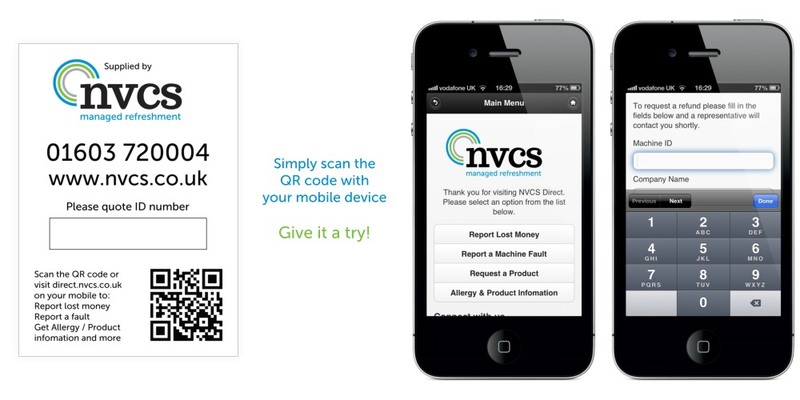 NVCS Direct is a new web-based mobile app that gives your vending machine end users a range of useful features from reporting issues to getting instant access to nutritional information and allergen advice. Working in conjunction with a QR code sticker positioned on your machine, the customer can simply scan the code with a smart phone and they will be taken to a mobile-enhanced website, no app install is needed. From there they can access a number of useful features. Direct to us, direct to you, a better service all round! The job of providing refunds or requesting new products has traditionally been the responsibility of the route operator. This method works but isn’t always convenient for the customer to try and remember what to tell the route driver while they are on site. With NVCS Direct concerns will be addressed faster without relying completely on the route operator. When a machine develops a fault keeping downtime to a minimum is key, whether we need to send an engineer or the problem can be resolved by a simple phone call. NVCS Direct gives your users the ability to report service issues directly to us within seconds of the problem occurring allowing us to respond faster. Nothing! We provide it as a free service to all our customers.